PRO-OSBORNE, ANTI-FARAGE BIAS: Two successive days, two key studio events in which the respective sides in the referendum debate put their respective arguments. One was George Osborne’s appearance (Wednesday) with Andrew Neil and the other, the ITV programme on Tuesday evening in which a studio audience put questions to Nigel Farage and David Cameron. BBC1’s News at Ten covered both set-pieces as their lead story. Huw Edwards introduced the coverage of the Neil interview by indicating that the Chancellor had rejected claims that he was trying to scare people into voting to remain in. Political editor Laura Kuenssberg provided commentary. If we vote to leave then we lose control. We lose control of our economy, if you lose control of your economy, you lose control of everything. And that’s not a price worth paying. (on screen behind them is ‘£4300 a year cost to UK families if Britain leaves the EU) Leave it out. Because people need to know, people need to know. You listen to everyone, and they’re telling you that Britain will be poorer, the families in Britain will be poorer. Look, we can talk about any number of numbers, they’ve all got in common one big fat minus in front of each one, that’s the consequence for the people watching this programme. People should be clear, they might have concerns about immigration, but that is not on the ballot paper. Our membership of the EU and all the prosperity and our role in the world, that’s on the ballot paper. Turkey is a key ally, they’re a member of NATO, by the way an organisation we all talk up on all sides of the campaign. But, is it going to be a member of the European Union? No, it’s not. The British government policy is it (Turkey) should not join the European Union, today. I do not want Nigel Farage’s vision of Britain. It is mean, it is divisive. It is not who we are as a country. …Britain is a great country. …I’m fighting for the soul of this country. …Sadly, Nigel Farage and his vision of Britain has taken over the Leave campaign. That adds up to 258 words in which Osborne put across the core economic parts of the ‘remain’ case’, dismissed the idea that Turkey would join the EU imminently, that the ‘exit’ side could not tackle immigration, that Nigel Farage had a ‘mean and divisive’ approach, and, sadly, that Farage policies had taken over Vote Leave campaign. Andrew Neil’s strongly adversarial questions in which he accused Osborne of telling untruths, and exaggerating the alleged threats to the economy, had been cut out. Kuenssberg’s inserted in her commentary her own alternatives, but they did not match Neil’s robust approach. She said that Osborne had ‘defended’ the decision to hold the referendum, and the strength of his warnings to exit; that the Chancellor had said the use of financial forecasts rather than facts was justified; that Osborne’s worst nightmare was this becoming a vote on immigration (after which, Osborne claimed that the idea that dealing with immigration was on the ballot paper); and that Osborne had tried to kill off the outers’ claims that Turkey was on the way to joining the EU. Kuenssberg thus amplified some of the ‘remain’ points that the Chancellor put. George Osborne was pretty defiant throughout, saying that he wasn’t trying to scare people but literally in the same breath saying there was a lot actually to be scared about. What I think we will hear more of in the coming days from his side is this claim that somehow the Leave campaign has been hijacked by what he described as Nigel Farage’s mean and divisive message… But I think the Remain campaign have seized on this as a tactic they will try to employ in the next few days in the fortnight just now left to go before the referendum vote itself. They clearly think that it might help their cause if they somehow tarnish the whole Out campaign saying it’s just Nigel Farage’s vision. But Mr Farage himself will be subject to the same kind of grilling in the same studio on Friday night. If we have an Australian-style points system, rather than an open door to 508 million people, then actually it’ll be better for black people coming into Britain, who currently find it very difficult because we have this open door. Edwards added that David Cameron had claimed the reforms he had negotiated meant it was not time to walk away from the EU. People I’m sure will share many of my frustrations about the European Union, but frustrations with an institution or indeed a relationship are often not a justification for walking away. They’re an argument for staying and fighting for what you need – for jobs, for investment, for security for our country. Mr Farage rejected criticism, made earlier today by the Archbishop of Canterbury, that the Ukip leader was guilty of legitimising racism. 12% is exports to the European Union. The other 88% . . . CHAIR: (speaking over) Mr Farage this question . . . MALE AUDIENCE MEMBER: (interrupting) This is specifically about pharmaceuticals, sorry, yeah . CHAIR: (speaking over) And also about jobs too. MALE AUDIENCE MEMBER: 32.4 billion – 2004 (fragment of word, unclear) report from the Government, right, so get that around your head, 32.4 billion. Now, the European Medicine Agency is in London. It’s all the medicines, all the ground-breaking ones for the whole of Europe are reviewed in London and Brussels listens to us. You can’t do that if you are not part of Europe. NIGEL FARAGE: I’m sorry, I’m sorry, I’m sorry (applause) I’m sorry, this is entirely and utterly false. LAURA KUENSSBERG: Before long, rather than his warnings about immigration finding favour, several audience members turned instead on him. FEMALE AUDIENCE MEMBER: You have basically suggested that a vote to remain is a vote for British women to be subdued to the same horrific assaults. NIGEL FARAGE: Well, just calm down there a little bit. CHAIR: (interrupting) She asked it perfectly calmly . . .
NIGEL FARAGE: (speaking over) No, no, no, but I mean, you know, sometimes in life, what it says at the top of a newspaper page and what you have actually said can be slightly different things. Look, I am used to be demonised. FEMALE AUDIENCE MEMBER: Are you not embarrassed that Justin Welby today said you are legitimising racism? NIGEL FARAGE: Well, I’m sorry, and I’m not going to stand here and attack the Archbishop of Canterbury . . . FEMALE AUDIENCE MEMBER: But you are anti-immigration. You have used scaremongering and inflammatory comments. NIGEL FARAGE: (speaking over) Well, look, I’ll tell you what . . . FEMALE AUDIENCE MEMBER: . . . in your campaign . . .
NIGEL FARAGE: (speaking over) I’ll tell you what . . . FEMALE AUDIENCE MEMBER: . . . that have gone against people that look non-white. NIGEL FARAGE: If you really . . . FEMALE AUDIENCE MEMBER: How are non-white British people going to stop facing discrimination . NIGEL FARAGE: (speaking over) If you really want to think that . . .
NIGEL FARAGE: I’m sorry, I’m sorry . . .
[blockquote]12% is exports to the European Union. The other 88% . . . I’m sorry, I’m sorry, I’m sorry I’m sorry, this is entirely and utterly false… Well, just calm down there a little bit. …No, no, no, but I mean, you know, sometimes in life, what it says at the top of a newspaper page and what you have actually said can be slightly different things. Look, I am used to be demonised. …Are you not embarrassed that Justin Welby today said you are legitimising racism? …Well, I’m sorry, and I’m not going to stand here and attack the Archbishop of Canterbury . . . Well, look, I’ll tell you what . . . I’ll tell you what . . . If you really . . .If you really want to think that . . . I’m sorry, I’m sorry . . .
None of this added up to a coherent argument or point about the EU ’exit’ case. The BBC’s presentation in the main body of the report had pushed the ‘racism’ allegations against Farage to the forefront, and it had made the angry woman who pushed the point the fulcrum of the sequence. The only positive point made by Farage – about the Australian immigration points system was in the introduction. MALE AUDIENCE MEMBER 2: You wanted to remove the free movement of people so that we could recruit skilled people from all over the world. Not baristas from the EU. You were, basically humiliated on that. So . . . why on earth are you now saying the EU is wonderful, you were saying you’d leave if you didn’t get those reforms? What I said in the reforms that I sought, I said we need it to be less of a single currency club, so I wanted guarantees for the pound, our currency, and I got those, I said I wanted it to be less bureaucratic so I wanted targets to cut regulation, including on small businesses and I got that. LAURA KUENSSBERG: Again, the audience though turned to immigration. The Prime Minister pushed on the promises he made. DAVID CAMERON: Well, obviously I, I (pauses during applause) obviously I don’t agree with that. I think the biggest risk we can take is to pull out of the EU, pull out of the single market. We need to be in this organisation, fighting for British interests and for British jobs. Leaving is quitting. I don’t think Britain, I don’t think we are quitters. I think we are fighters, we fight in these organisations for what we think is right. Mr Cameron thus faced complaints that he had not got he wanted – and had been ‘humiliated’ – in his negotiations with the EU, and then that he had not kept immigration down in accordance with the Conservative manifesto and as a result living standards were under threat. Cameron’s combined response, totalling 134 words, was marginally longer than Farage’s. But unlike with Farage, he was able to make two substantive points, uninterrupted, about his claimed achievements in the EU negotiations and that the biggest risk faced by the UK was not immigration but economic threats that would be caused by an EU ‘exit’. In addition, in the introduction, he was able to stress prominently the importance of the EU to the UK. As almost always with dissection of what was actually said and presented, the devil here is in the detail. Obviously in getting to air by 10pm the Cameron/Farage sequence, BBC editors were faced with a tough, against-the-clock task in whittling down the hour-long ITV programme that finished an hour earlier down to a digestible feature. But the end result showed considerable bias. The sequence that editors chose featuring Farage contained at its heart an aggressively-put accusation of racism that had seemingly been backed by the Archbishop of Canterbury. It was a heated exchange, and Farage was on the back foot against strong invective, trying to put his response. The panellist was working hard to prevent him doing so, and Julie Etchingham, the ITV presenter, sided with her. As a result, Farage was unable to put forward a considered reply. In the preceding section about the impact of Brexit on the export of medicinal drugs, the Ukip leader was able to make only a fragmentary point about the proportion of British goods that went to the EU. The editors thus chose a sequence about the ‘exit’ case which made for entertaining and tense television. But almost all elements of the exit case – put on a more measured basis by Farage elsewhere in the ITV programme – were not included. It looked and felt as if the core issue being faced was whether the ‘exit’ camp was racist, and this was emphasised, as has already been noted above, by mentions of this by Edward and Kuenssberg. The sequence involving David Cameron also contained toughly-put questions and Kuenssberg said in her commentary that he had faced negativity from the audience. But in sharp contrast to the handling of Farage and ‘the exit’ case’ Cameron was able to make two strong uninterrupted points about the ‘remain’ case. With the Osborne sequence, the editors chose to cut out almost completely Andrew Neil’s questions. In so doing, they threw out the baby with the bathwater. The Chancellor had in fact faced a barrage of negative points from Neil. It should have been left to the audience to decide whether he had answered them satisfactorily – but with the News at Ten editing, they had no chance to do so. The excision of the Neil questions converted a tense, finely balanced piece of broadcasting into the equivalent a party political broadcast on behalf of the ‘remain side’, and nothing Kuenssberg said by way of commentary diluted this impression, if anything, her observations amplified his various messages. Then, in her summing up, she mentioned his reference to Nigel Farage’s ‘mean and divisive’ message. Her choice of this as her ‘out’ message compounded the bias shown the previous evening. Not only was Nigel Farage, in the BBC’s chosen emphasis, a racist, but also he was – in line with what George Osborne claimed – in danger of dragging the whole ‘leave’ campaign down. Balance in daily programmes is not required in individual editions, but here, in two consecutive nights, in the treatment by News at Ten of headline issues of the greatest importance in the unfolding referendum debate, the BBC’s main newsreader, its political editor and its editors on its flagship BBC1 news programme, showed strong bias against arguably the highest-profile figure in the ‘exit’ case. By contrast, they gave George Osborne the easiest possible ride, and in effect created a party political broadcast for the ‘remain’ case. HE: Good evening. Immigration and economic prospects have featured prominently in the latest exchanges tonight ahead of the referendum on Britain’s membership of the EU. Nigel Farage, who’s campaigning to leave, and David Cameron, who’s campaigning to remain, have both been answering questions from voters in a live television event on ITV. Mr Farage rejected criticism, made earlier today by the Archbishop of Canterbury, that the Ukip leader was guilty of legitimising racism. Our political editor Laura Kuenssberg watched the exchanges. LAURA KUENSSBERG: (Nigel Farage arrives on purple bus) He’s waited years for this, so was never going to turn up discreetly. A moment of visible nerves for the man who has made a career of being blunt. (On David Cameron) He wants and needs to win. And despite his demeanour, the path to the referendum is proving far from smooth. Both politicians taking on the toughest challengers, not each other, but the voting public. Without hesitation, the audience demanded to know why believe him that the economy would be safe outside the EU? NIGEL FARAGE: 12% is exports to the European Union. The other 88% . . . MALE AUDIENCE MEMBER: (interrupting) This is specifically about pharmaceuticals, sorry, yeah . . .
MAM: 32.4 billion – 2004 (fragment of word, unclear) report from the Government, right, so get that around your head, 32.4 billion. Now, the European Medicine Agency is in London. It’s all the medicines, all the ground-breaking ones for the whole of Europe are reviewed in London and Brussels listens to us. You can’t do that if you are not part of Europe. NF: I’m sorry, I’m sorry, I’m sorry (applause) I’m sorry, this is entirely and utterly false. LK: Before long, rather than his warnings about immigration finding favour, several audience members turned instead on him. NF: Well, just calm down there a little bit. NF: (speaking over) No, no, no, but I mean, you know, sometimes in life, what it says at the top of a newspaper page and what you have actually said can be slightly different things. Look, I am used to be demonised. FAM: Are you not embarrassed that Justin Welby today said you are legitimising racism? NF: Well, I’m sorry, and I’m not going to stand here and attack the Archbishop of Canterbury . . .
FAM: But you are anti-immigration. You have used scaremongering and inflammatory comments . . .
NF: (speaking over) Well, look, I’ll tell you what . . .
FAM: . . . in your campaign . . .
NF: (speaking over) I’ll tell you what . . .
FAM: . . . that have gone against people that look non-white. NF: If you really . . .
FAM: How are non-white British people going to stop facing discrimination . . .
NF: (speaking over) If you really want to think that . . .
NF: I’m sorry, I’m sorry . . .
LK: And look what he was ready to brandish, when asked how leaving the EU would keep us safe. NF: This is, should be a British passport, it says European Union on it. All right. I think, to make this country safer we need to get back British passports so that we can check anybody else coming in to this country. CHAIR: Can we allow Mr (name unclear) back in? NF: I really do. (applause) The project doesn’t work. I want us to get back our independence but to say we’ll be good Europeans, we’ll trade with Europe, co-operate with Europe, but govern ourselves. LK: After a hostile half hour, the Prime Minister walked on to more tough demands. A damming verdict on the deal he brokered with the rest of the EU. DAVID CAMERON: What I said in the reforms that I sought, I said we need it to be less of a single currency club, so I wanted guarantees for the pound, our currency, and I got those, I said I wanted it to be less bureaucratic so I wanted targets to cut regulation, including on small businesses and I got that. LK: Again, the audience though turned to immigration. The Prime Minister pushed on the promises he made. DC: Well, obviously I, I (pauses during applause) obviously I don’t agree with that. I think the biggest risk we can take is to pull out of the EU, pull out of the single market. We need to be in this organisation, fighting for British interests and for British jobs. Leaving is quitting. I don’t think Britain, I don’t think we are quitters. I think we are fighters, we fight in these organisations for what we think is right. LK: Like the wider public, the audience wouldn’t swallow either side’s case without complaint. Tonight’s applause will have faded long before the arguments are won. HE: Well, those exchanges ended about half an hour ago, within the last half hour. Let’s go to the Olympic Park in East London where they took place, Laura is there for us, Laura Kuenssberg. What was your impression then Laura, of the way that Mr Cameron and Mr Farage succeeded or didn’t succeed in getting their cases over? LK: Well, Huw, you know, one man, Nigel Farage, came here tonight probably with not very much to lose. One man, David Cameron, came here tonight with pretty much everything to lose. But I think at the end of the debate really neither of them were winners. This was a very hostile, intense hour of conversation with the audience. The clashes were dominated by immigration. But in a sense, I felt the audience was rather frustrated by what they heard from both of them. Nigel Farage was more or less accused of stoking up racism. But the Prime Minister was accused of breaking his promises too. And there was a sense, it’s so interesting and so telling when the public gets hold of politicians on debates like this that they somehow weren’t satisfied with what they have been hearing, either in the last few weeks or tonight here at the Olympic Park. There is a sense that audiences and perhaps the wider voting public wants more answers, more clarity, maybe even still more information from their politicians. But we are hurtling towards this referendum now and there is nothing at all certain about new or different answers being provided. HE: Okay Laura, thanks very much. Laura Kuenssberg therefore is at those televised debates Thank you. HUW EDWARDS: George Osborne says the forthcoming referendum is a fight for the soul of the country. In a BBC interview with Andrew Neil this evening the Chancellor rejected claims that he’s trying to scare people into voting to remain in the EU. Our political editor Laura Kuenssberg listened to the exchanges. ANDREW NEIL: Tonight in the studio live the Chancellor, George Osborne. LAURA KUENSSBERG: The money man, the Tories’ tactician, defending the decision to hold this referendum, defending the strength of his warnings about exit. GEORGE OSBORNE: If we vote to leave then we lose control. We lose control of our economy, if you lose control of your economy, you lose control of everything. And that’s not a price worth paying. LK: The Chancellor said the use of forecasts . . .
GO: (on screen behind them is ‘£4300 a year cost to UK families if Britain leaves the EU) Leave it out. Because people need to know, people need to know. AN: I will leave it out . . .
LK: . . . not facts was justified. Trying to stick to the economic script. GO: You listen to everyone, and they’re telling you that Britain will be poorer, the families in Britain will be poorer. Look, we can talk about any number of numbers, they’ve all got in common one big fat minus in front of each one, that’s the consequence for the people watching this programme. LK: But Mr Osborne’s worst nightmare is this becoming a vote just on immigration. AN: If all this is . . .
GO: People should be clear, they might have concerns about immigration, but that is not on the ballot paper. 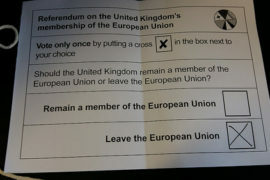 Our membership of the EU and all the prosperity and our role in the world, that’s on the ballot paper. LK: He tried to kill off the Outers’ claims that Turkey is on the way to joining the EU and millions of Turks could be on their way here. GO: Turkey is a key ally, they’re a member of NATO, by the way an organisation we all talk up on all sides of the campaign. But, is it going to be a member of the European Union? No, it’s not. LK: Never ever? Not quite what he said. 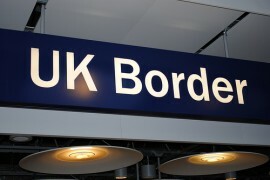 GO: The British government policy is it should not join the European Union, today. LK: But the bigger clash he believes of ideas and of instinct. GO: I do not want Nigel Farage’s vision of Britain. It is mean, it is divisive. It is not who we are as a country. GO: Britain is a great country. AN: I understand that . . .
GO: I’m fighting for the soul of this country. AN: But, but we’re also fighting for truth . . .
GO: Sadly, Nigel Farage and his vision of Britain has taken over the Leave campaign. LK: Vote Leave led, not by Nigel Farage, remember it’s run by his Tory colleagues. This is a campaign, though, for every political party. And much more importantly, it’s a choice for every single one of us. George Osborne was pretty defiant throughout, saying that he wasn’t trying to scare people but literally in the same breath saying there was a lot actually to be scared about. What I think we will hear more of in the coming days from his side is this claim that somehow the Leave campaign has been hijacked by what he described as Nigel Farage’s mean and divisive message. Now, Nigel Farage, of course, isn’t even part of the official Leave campaign. It’s run by senior Conservatives and some people from the Labour Party too. But I think the Remain campaign have seized on this as a tactic they will try to employ in the next few days in the fortnight just now left to go before the referendum vote itself. They clearly think that it might help their cause if they somehow tarnish the whole Out campaign saying it’s just Nigel Farage’s vision. But Mr Farage himself will be subject to the same kind of grilling in the same studio on Friday night. HE: Okay, Laura, thank you very much. Laura Kuenssberg there for us at Westminster.